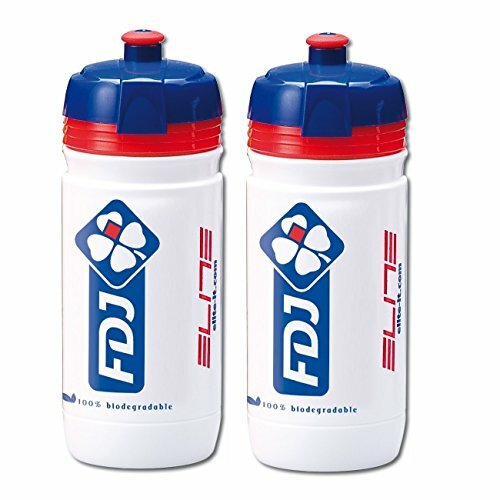 Team FDJ Elite Corsa Water Bottles is an exact replica of those that are used in the world tour series, featuring ergonomic design to easily be taken out of your bottle cage and used easily, allowing you to keep your focus on other, more important things. It features a sporting and functional design with a standard diameter of 74 mm it can be used with all conventional bottle cages available on the market. In the upper part, the slightly narrower body and the cap with a series of rings facilitate gripping and holding the bottle even in extreme conditions. The new large opening enables quick filling of the bottle with supplements and beverages as well as easy cleaning.